Bali is a beautiful island in the province of Indonesia. Known for its white sand beaches, bright green paddy fields and vast temples and underwater life, it ticks so many boxes for travellers. This stunning island, which stretches out for around 4000km, is not short on opportunities to maximise fun and adventure – and it doesn’t hurt that it’s all so affordable. From underwater dreamscapes to over-land trekking and lush green jungles, Bali has it all for the tourist that likes to get out and about, really seeing what the country is made of. Or maybe relaxation is more your speed? Not to worry – there are plenty of spots where you can pamper yourself, eat your fill (again at incredible prices – yes!) and enjoy a few days of full-on luxury. Why not grab a group of girlfriends and book a beautiful villa in Bali to add to give yourselves the very best spot to unwind? Whatever your reason for travelling to this Indonesian island paradise, we recommend you fill at least some of your days with adventure though! Whether it’s the more sedate variety or something to really get your adrenaline pumping – there’s something for everyone here. Have more time up your sleeve? We recommend you check out these things to do in Nusa Lembongan and make a beeline for this island paradise. 1. 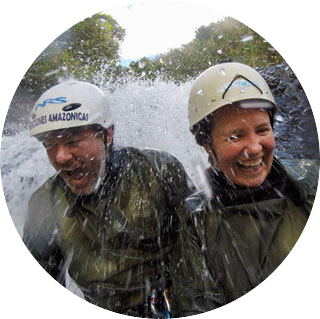 White-Water Rafting – Fun on the water with friends! If you want to spend an adventurous day, filled with watery thrills, then you’ve got two main choices on the island – Ayung River (which is near Ubud) or the rugged, picturesque Telagawaja River (in the eastern region). Not only will you cool down in the water and get a good burst of exercise but you’ll enjoy amazing views and may even spot an exotic animal or two! The rafting in Bali isn’t exactly world-class but it is perfect for beginners and those looking to test their skills (and nerve) on a smaller river. If this sounds like you, you’ll find the best time to take to the river is after the wet season – from November to March. During this time the grade 2 and 3 rapids are at their best. What the region lacks in challenging rafting, it certainly makes up for in scenery. Its unspoiled jungle and towering gorges will take your breath away as you paddle your way home. Surfing is a perpetual visitor fave, with tourists from all over the world visiting to surf the southern coast soak up the sun’s rays. Here, the beaches are packed with surfing schools and relaxed and friendly hostels, making it the perfect place to kick back and relax on the cheap. It’s the Bali that every teenager dreams of! If you’re wanting to hit their world-class surf breaks, we recommend the Bukit Peninsular Kuta or, in a pinch, Kuta Beach if you can’t get out of town. The prime surf season runs from April to November when the waves consistently reach up to 12ft so it’s best to plan your trip to fall between those months if you’re following the waves. For your average surfer though, waves of some level can be found any time of year. The colourful marine life, consistently warm water and beautiful seascapes see South-East Asia frequently rated amongst the world for world-class diving and Indonesia is no different. If you’re visiting the island without prior experience, there are plenty of recognised dive centres that can support you through your training and point you in the direction of the best reefs. Alternatively, if you’re already PADI certified, remember to bring your dive card so you can jump right on in! In Nusa Penida, you may have the change to see sunfish and manta rays or if you’d prefer a wreck dive (the USS Liberty to be exact), head in the direction of Tulamben. 4. Not Keen to Dive? Snorkeling might be for you! If diving’s not for you (and it’s not everyone’s cup of tea), there are some great spots for snorkeling on the north side! Just don a mask, snorkel and fins and hit the water. These tropical waters are included within the infamous Coral Triangle and as a result, boast some of the best water-life and sea-gardens around. If you’re staying close to the southern part of the island then a trip to Nusa Dua is easily done, or you may like to consider Menjangan Island, Nusa Lembongan or Padangbai if you have a little more time up your sleeve. Whilst visiting Bali, it’s worth planning some hiking time to ensure you get up-close-and-personal with the country’s magnificent landscapes. Whether it’s an adventurous day hike through the jungle, mountain lakes and forest at the Kerinci Seblat National Park or a more relaxed wander to the ancient temples of the Tana Toraja region, it’s worth taking the time to see more rural areas by foot. Or, if you’re short on time and aren’t able to get out of the main towns, we absolutely recommend a visit to Ubud’s Monkey Forest. The monkeys are captivating and the sculptures which are slowly being taken over my moss are equally so. If you’re hoping to cover more ground than hiking will allow but still want to experience Indonesia at the grass-roots level, a bike may be the best way to do exactly that. Experiences vary of course but if you’re looking for an easy start, we recommend picking up a bike locally in Ubud to find your ‘biking feet’ so to speak. Ready to take it up a notch? There are a wide variety of challenging rides available on the island – so many in fact, it may be hard to choose! If you do have the time, be sure to fit a visit to the rice terraces in Ubud Jatiluwih into your cycling itinerary. There you’ll find the stunning beauty that Bali is known for along with their traditional Balinese irrigation system – the designs of which have been passed down through generations from the eighth century. The Jatiluwih rice terraces were once a UNESCO cultural heritage site and make the best photo-op even now. Monuments, temples, mountains, beaches, vast rice fields – you’ll discover them all just as you would on foot, only with a bike at your disposal you’ll be able to fit much more into your day. Or you’ll be able to finish up earlier and treat yourself to a massage or visit to a coffee plantation – doesn’t sound too shabby to me! Bali offers so much to holiday-makers wanting to reconnect with nature whilst having an adventure of their own. It’s a relatively easy country to travel within, offers excellent value, a great touch of luxury (if that’s what you’re looking for) and gorgeous scenery. Could it be your next holiday destination? This entry was posted in Activities, Adventure, Bali, Indonesia. Bookmark the permalink.